值得玩味的是,自從 王寒非被郴州市公安和檢察機關以詐騙罪關進看守所後,就陸續有風言傳進我的耳朵: 王寒非並不是“詐騙罪”三個字那麼簡單；他的案子也不是郴州市定的,而是中央早在兩年前以”重案”定調的,且有中央四個主要領導親自批示的.對此,我將信將疑,既然是兩年前中央就定”重案”之調要抓 王寒非,那為何要遲在去年的7月15日傍晚才抓?而郴州市公安和國安當時抓他的理由是:王在2012年初聘請了邵陽市覃某(復員軍人)為雜誌社總編助理時,在對方自願的情況下, 王寒非出具收據收取了覃某兩萬元責任保證金.幾個月後,王發現覃在具體工作中不能勝任做總編助理,於是解聘了他的助理職務,保留其記者一職.覃對此惱火,遂到郴州市公安局報案,說王騙了他兩萬元錢,如果說 王寒非作為總編緝正常解聘一個工作不能勝任的內部管理人員,且因收取了覃某的兩萬元保證金,覃某為此洩憤報復難道就要被中央定為“重案”，那麼報刊上經常公開報導的那些搶劫十萬甚至幾十萬,或官員貪腐幾百萬上千萬元又為何沒被中央冠以“重案”定性呢?如果中央首長為了一個兩萬元的案子就要親自批示為“重案”，那中央首長怎麼忙得過來呢?再則,既然 王寒非是經中央四位領導親自過問的“重案”,那麼王被抓至今已經整整一年,為何不見當地媒體向社會公眾公開報導此案的成功告破?難道是另有什麼隱情有意不宜讓社會公眾知道這個“重案”嗎?或者這個“重案”不值得報導嘛?對此不得而知. 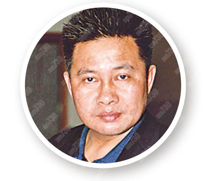 Wang Hanfei, editor of the Hong Kong-based journal “China Special Report” (中国观察), was sentenced to four years in prison in April 2013, likely for publishing articles that authorities deemed to be politically sensitive. Activists were blocked from observing the hearing, and authorities have warned Wang’s wife to keep silent about the case and prevented her from visiting Wang. In May 2013, it was reported that Wang was being forced to work long hours in prison, and had also been seriously beaten. Born in 1966, Wang registered the journal “China Special Report” in 2009 and published a large of number of articles ranging from disclosing official corruption, criticizing Chinese authorities to reporting human rights activists’ experience. He was taken into custody in July 2012 after publishing articles that disclosed corruption by the Chenzhou Communist Party secretary and praised Nobel Laureate Liu Xiaobo (刘晓波).